The tiara had previously been worn as a bridal diadem by the groom's sister-in-law, Marie-Chantal. 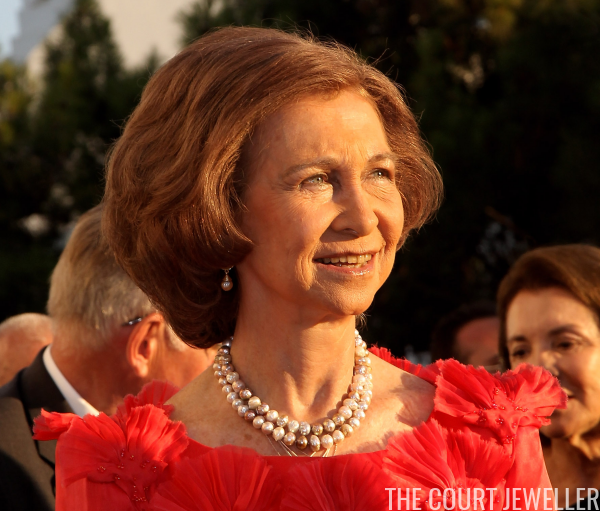 Tatiana paired the tiara with diamond and pearl drop earrings that look to have been made to echo the tiara's design. Tatiana's lace wedding gown was made by Angel Sanchez, who also hails from her native Venezuela. 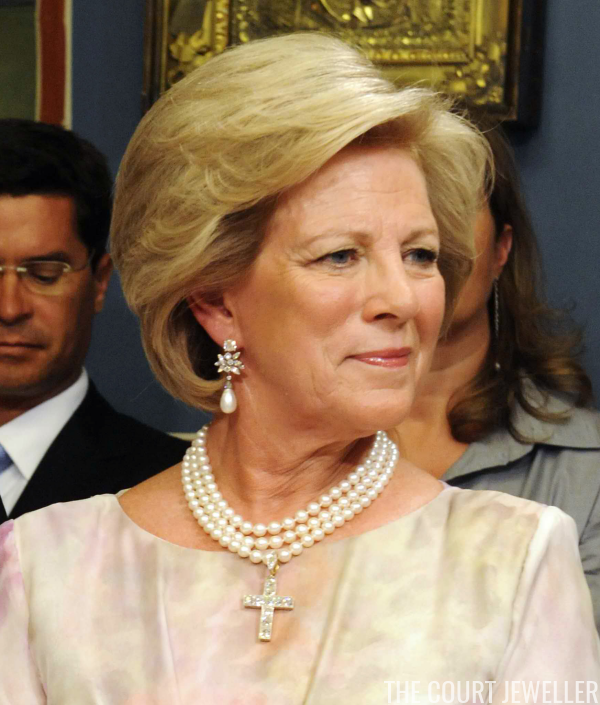 Prince Nikolaos's mother, Queen Anne-Marie, wore pearls and diamonds for her son's wedding. With a triple-stranded pearl necklace, Anne-Marie wore a striking diamond cross pendant. This was a wedding gift to Anne-Marie from her parents, King Frederik and Queen Ingrid. She also wore a pair of pearl drop earrings with an intricate diamond stud. 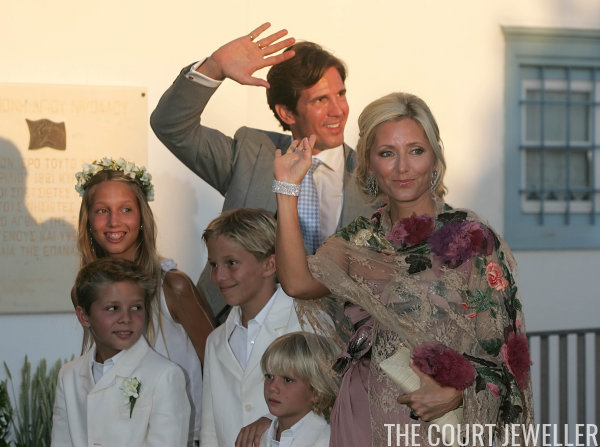 Nikolaos's elder sister, Princess Alexia, attended the wedding with her husband, Carlos Morales Quintana, and their four children: Arrietta, Ana Maria, Carlos, and Amelia. Alexia's major accessory was a pair of long pearl drop earrings. 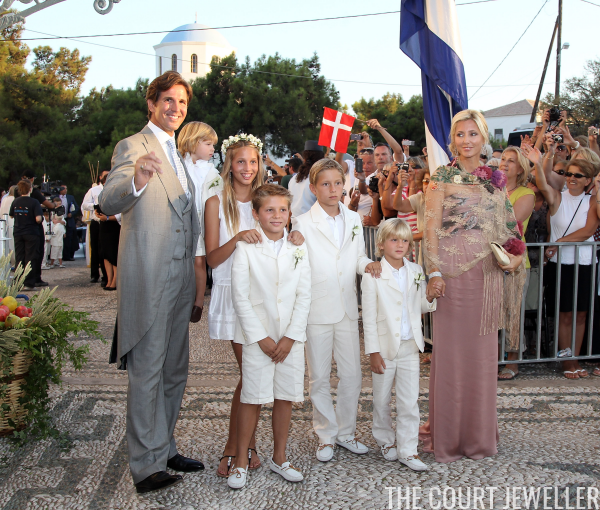 The groom's elder brother, Crown Prince Pavlos, and his wife, Marie-Chantal, also brought their entire double-named brood: Maria-Olympia, Constantine-Alexios, Achileas-Andreas, Odysseas-Kimon, and Aristidis-Stavros. Marie Chantal wore a large sapphire ring (not her engagement ring) on her left hand, plus intricate diamond earrings made for her by JAR. She also wore a sparkling diamond cuff bracelet on her right wrist. 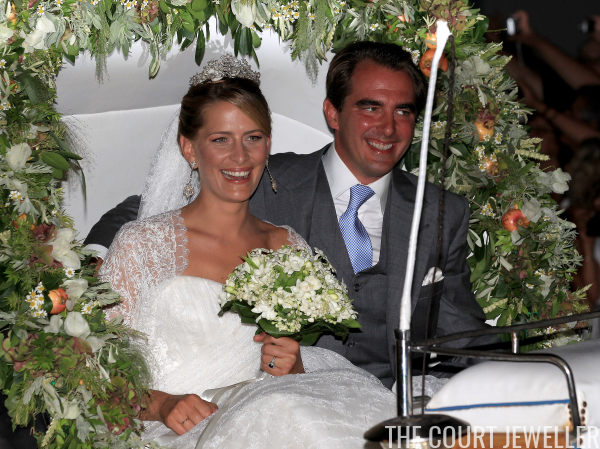 The groom's younger siblings, Prince Philippos and Princess Theodora, were also in attendance. Theodora wore her go-to pair of gala earrings: long, modern diamond earrings with round pearl drops. Another Greek princess also made an appearance: the groom's aunt, Queen Sofia of Spain. (She was the elder daughter of King Paul and Queen Friederike of Greece.) As usual, Sofia wore layered jewels, notably the stack of bracelets on her left wrist. Rather than her usual long, layered necklaces, she chose a double-strand of multi-colored pearls with coordinating earrings. But you'll note that she's wearing at least three more necklaces underneath -- you can just see the chains peeking out from under the pearls. 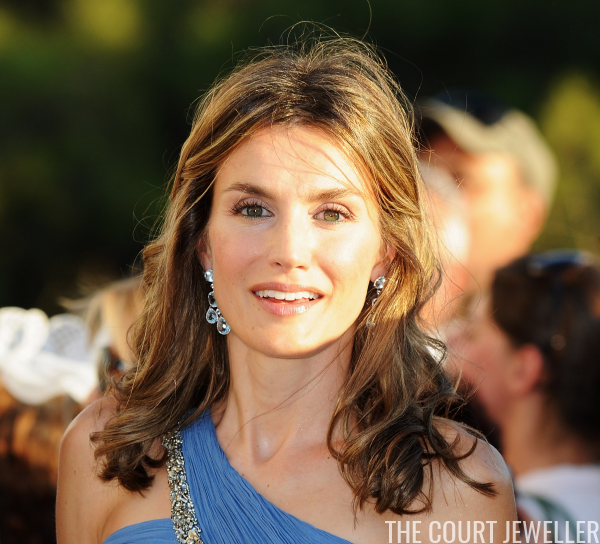 Sofia's daughter-in-law, Princess (now Queen) Letizia, wore aquamarine girandole earrings. Here's another angle on the earrings, which feature classic pale blue stones. She also wore her Cartier diamond bracelet. 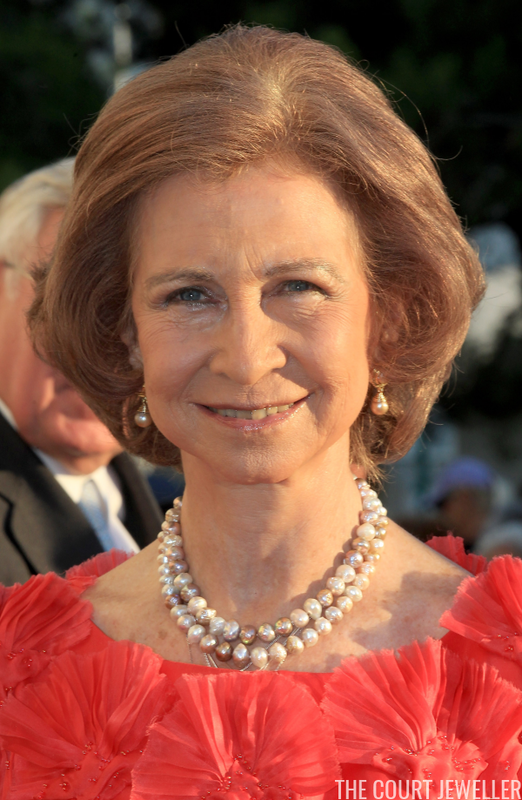 Infanta Elena of Spain, the groom's cousin, chose classic pearls for the wedding. She also brought a bit of Spanish flair along with her, via a charming fan. 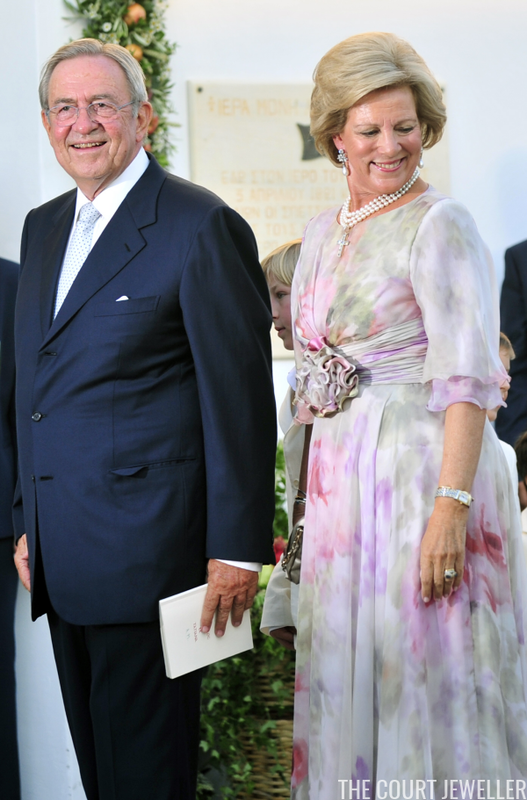 And, wrapping up the Spanish contingent, two people we no longer see at royal events: Infanta Cristina, another cousin of the groom, and her husband, Inaki Urdangarin. 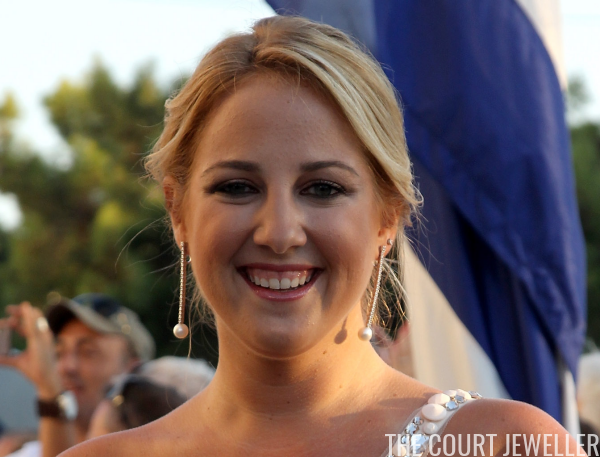 Cristina chose golden statement earrings for her cousin's wedding. Stay tuned later today for many more royals in Part 2 of this bejeweled flashback!